What’s the expression? No good deed goes unpunished. Sadly, they’d rather take a chance of wrongful treatment of their own employee than the PR nightmare the other folks threatened. A teen uses his own pocket money to do something nice for a cop. And some dumbass family decided they deserved to freeload off the kid’s generosity. A Texas teenager was suspended from his cookie store job after a customer became upset when he paid for a police officer’s order. Zachary Randolph, 18, was suspended from his job at a Great American Cookies mall after he bought a police officer a brownie out of his own wages on Sunday. The teen from Katy, Texas, said upper management put him on temporary leave for a week because another family complained that he didn’t buy their cookies as well. Randolph said the customers in line who overheard the interaction became upset and threatened to beat him up because he was racist and promised to get him fired. Oh, good. A sense of entitlement, the race card and the threat of violence. Because that isn’t cliche at all. Were they wearing their BLM shirts, too? You tell them you offer products for sale. People who do not wish to Pay for the products they order can kindly take a hike. [Or, unkindly they can go do something biologically improbable to themselves.] If they return, security will be called. If someone is demanding something for free, and making threats against you if they don’t get it, that’s extortion. The cop who got the free brownie would be happy to have a little chat with them over how serious the charge of extortion is. In fact, someone threatening to beat someone up really OUGHT to be getting a visit from the police. If the Great American Cookies company had any sense, they would not only have backed their employee, they would have given him something of value — possibly money toward a scholarship. If they were really smart they would have held him up as an example of one of their exemplary employees, and encourage such civic-mindedness in their staff as a whole. Now they’ve just got a PR nightmare on their hands. And worse than that, they come off as a company who didn’t even care about the safety of their own employees. Suspending the guy who was threatened with violence for showing kindness to a cop. Gee, that seems like a ‘bright idea’. It looks like the kid is more MORALLY fit to run that company than whatever dunderhead made this decision. Management reversed their decision ‘after the fact’. In a statement released to the Houston Chronicle, Biju George, owner and operator of the Great American Cookies at Katy Mills Mall, said: ‘On behalf of Great American Cookies Katy Mills, we owe the employee an apology. ‘It was never an issue that he purchased a brownie for a police officer, but rather the events that unfolded with another customer in line at the time. 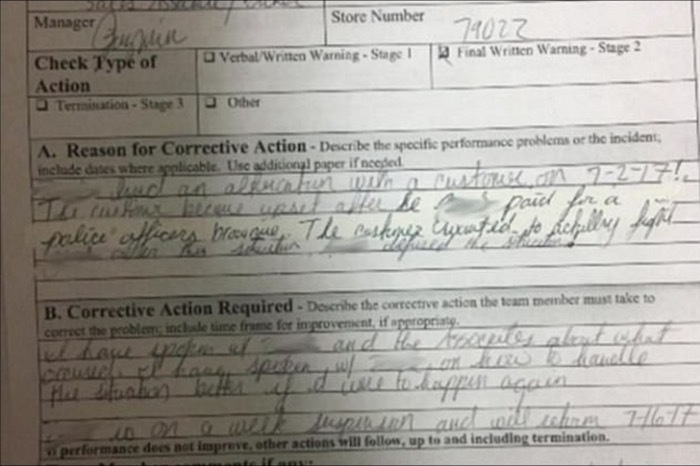 ‘However, after further review, we realize that the employee was in fact in the right and we continue to reach out to him and his mom to issue an apology. That ‘kid’ is being raised right, he’ll be fine. His supervisor, however, needs to get his hands on this book, pronto. Share if pandering to troublemakers is NOT good for business, OR society.